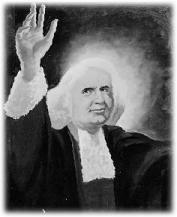 George Whitefield was born, the youngest of seven children, on December 16, 1714, in Gloucester, England. He was born in the Bell Inn where his father, Thomas, was a wine merchant and innkeeper. His father died when George was two, and his widowed mother, Elizabeth (born in 1680), struggled to provide for her family. At about age 15, George persuaded his mother to let him leave school and work in the inn, because he thought he would never make much use of his education. However, at night George sat up late, becoming a diligent student of the Bible. His Mother was visited by an Oxford student who worked his way through college and this report encouraged George to pursue a university education. He returned to grammar school to finish his preparation to enter Oxford, losing about one year of school. In November, 1732, at age 17, George entered Pembroke College at Oxford. He was gradually drawn into a group called the "Holy Club," where he met John and Charles Wesley . Charles Wesley loaned him a book, "The Life of God in the Soul of Man." This book, after a long and painful struggle which even affected him physically, finally resulted in his conversion in 1735. He said many years later: "I know the place...Whenever I go to Oxford, I cannot help running to the spot where Jesus Christ first revealed himself to me, and gave me the new birth." Forced to leave school because of poor health, he returned home for nine months of recuperation. However, he was far from idle, and his activity attracted the attention of the bishop of Gloucester, who ordained Whitefield as a deacon and later a priest in the Church of England. Whitefield finished his degree at Oxford, and on June 20, 1736, Bishop Benson ordained him. He placed his hands upon his head — whereupon George later declared, "My heart was melted down, and I offered my whole spirit, soul and body to the service of God's sanctuary." Whitefield was an astounding preacher from the beginning, and within a year it was said that "his voice startled England like a trumpet blast." At a time when London had a population of less than 700,000, he could hold spellbound 20,000 people at a time at Moorfields and Kennington Common. For thirty-four years his preaching resounded throughout England and America. He was a firm Calvinist in his theology, yet unrivalled as an aggressive evangelist. Though he was slender in build, he stormed in the pulput as if he were a giant. Though a clergyman of the Church of England, he cooperated with and had a profound impact on people and churches of many traditions—Presbyterians, Congregationalists, Baptists, and along with the Wesleys, inspired the movement that became known as the Methodists. In his preaching ministry he crossed the Atlantic thirteen times and became know as the 'apostle of the British empire.' A century later, the great Baptist preacher, C. H. Spurgeon wrote of Whitefield, "Often as I have read his life, I am conscious of distinct quickening whenever I turn to it. He lived. Other men seemed to be only half-alive; but Whitefield was all life, fire, wing, force. My own model, if I may have such a thing in due subordination to my Lord, is George Whitefield; but with unequal footsteps must I follow in his glorious track." Whitefield preached more than 18,000 sermons in his lifeftime, an average of 500 a year, or ten a week. Many of them were given over and over again. Fewer than 90 of them have survived in any form. The Anglican Library, copyright 2001.